Who Are the Lochac Pelicans? Images of pelicans from a very interesting site on medieval pelicans put together by Mistress Elizabeth Braidwood of An Tir. 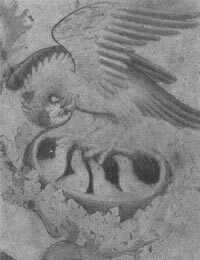 "Page of bird drawings from the Pepysian sketchbook by an English artist." Late 14th C., held at Magdalene College, Cambridge. "Grants by William Hervy, Clarenceux, all of c. 1560, to [...] Tyldesley [...] (Coll. 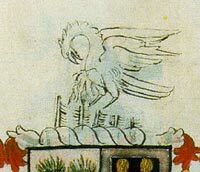 Arms, L 9, fo.29)"
If you are not familiar with the Order of the Pelican, it is one of the SCA Peerages, equal in standing with the Knights, Laurels, Defence and Royal Peers. It is the highest award given in the SCA for Service to the Society. Pelicans are the people who organise event after event, hold offices, do the paperwork and running round to start new groups, and so on. For more information on a Pelican's role, see What Do Pelicans Do?. 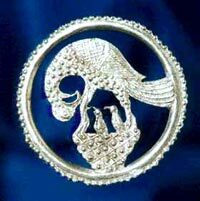 Members of the Order are called "Master" or "Mistress/Dame" and wear a medallion with the symbol of the Order -- a Pelican in its Piety. In medieval times it was thought that pelicans stabbed their breasts and fed their young on their own blood in times of famine. Thus the pelican became a symbol of self-sacrifice beyond the call of duty. 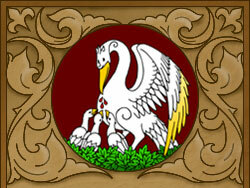 In Lochac, Pelicans in fealty to the Crown may also wear a chain of fealty. Many Pelicans have pelican symbols on their cloaks or other clothing. If you have any comments or suggestions for this website, please contact the Pelican Webwright.